of these 3 equal sides that also lines up the best possible sales. The tricky part here is: equally, since each of you will be prone to giving one side or the other more weight. But Side #3 -> Your Audience felt like an entire blog post. And, yes, on the surface this seems to fly in the face of my equal weight point. I’m going to step on the scales for a minute. True, there are those artists who create for their own pleasure alone. They are few and far between. The rest of us feel incomplete, or slightly dissatisfied if no one else sees our work. Most artists have something to say, which implies there is someone else to hear it, see it, taste it, touch it. I would argue that having an audience for your work is as essential as the work itself. And that for many of you having a buying audience is even more essential. Besides the social animal fact of our human specie, we need each other as witnesses to our lives. And artists, who delve into the creative core of their hearts and souls, have an even deeper need of that witnessing. Without your audience of potential buyers and collectors (or fans and admirers), there is a hollow space beneath the creative vision. 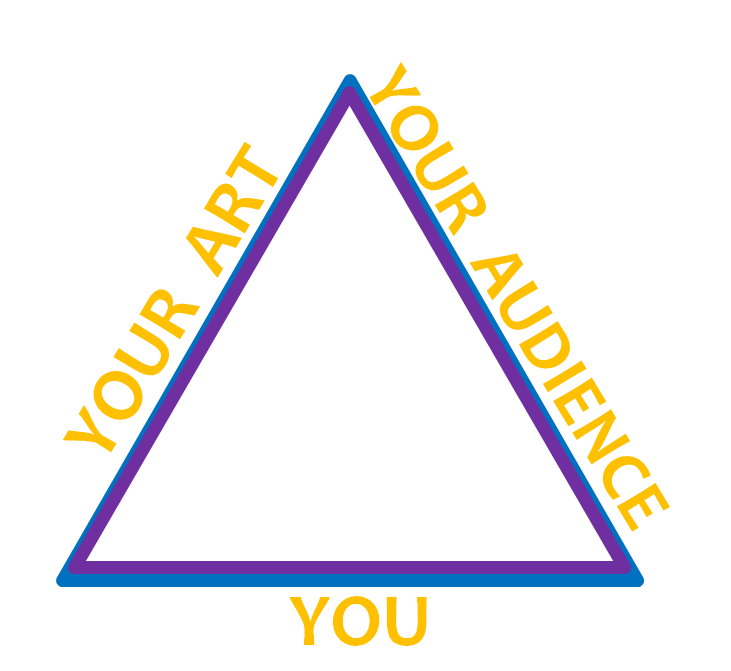 So, how does one begin to give equal weight to the Audience side of the Sell-Your-Art Equilateral Triangle? One of the things I love most about the Social Media revolution is that it has put the issue of trust right out front. Over time, tweeting and posting begins to reveal a personality that you either identify with or don’t. People expose their values, their preferences, and their positions. (And those who don’t will signal that maybe, just maybe you can’t trust them as much as you’d like to.). What are some of the ways you have discovered you can give your audience this trust in you and your work? The comment line is OPEN! Keep your eye on August because we’re going to delve into the many, many other ways, besides selling your art through galleries or by yourself, you can create a healthy cash flow. Now why am I reading a blog about children’s tantrums when I don’t have any children? Wow! The tantrums I see are truly remarkable…Like being an artist gives you the right to be a jerk? Yes, Sari, I know exactly which tantrums you are referring to as I’ve been watching you – and them – in this online conversation that sort of went off the tracks. First, a note to you about that: GO GRL! Your responses rocked, even if the artist was so preoccupied with self-congratulatory righteousness that he had no clue he’d just been check mated! I love your awareness of the biology as well as the psychology affecting the trigger releases for inappropriate responses (online and off, I might add). And your point about being trustworthy in order to generate trust is a gem. In our overlapping universes, you have managed to bring up the point of trust between artists, just as I’m writing (right now, took a break to come here) about the artist-to-artist relationship for next month’s blog post. As for exploring the medical world, one of my best friends and artists started out as a medical transcriber before she grew her artist hair out – she and I talk all the time about science/medicine and art–one of the most compatible combinations ever! As for narrow-minded artists… let’s just say that even though artistic temperaments are quite different from, say, an electrician, artists’ biological, psychological, emotional, and personal history are standard fare with the rest of humanity. There’s a reason that reason isn’t sufficient to engender transformation, change… or trust. Immaturity has no professional boundaries, at least not as far as I’ve seen. oh, goodie gum drops – I get to go to bed tonight with a big smile on my face! Love also seems to not have any professional boundaries these days, Sari, something else I’m relishing about our New World. ♥ to you, good woman! Art & Science. I am reading, for the third time, Art & Physics bu Leonard Shlain. It is not an easy ride but worth it. I have a leg up having a background in both fields but the parallelism is astounding. On my list, Norman, on my list…(Art & Science). Art and Physics, on the other hand, I wasn’t aware of. Sounds like good summer reading for my time off! Thanks! I have noticed over the years, 75 of them, that very often people ignore you or do not even realize the you disagree when you stay ‘cool’. Research has shown that a firm, even aggressive response is all that will get through. As a teacher staying cool only serves to give the teacher ulcers. Hmmmm, can’t say I’ve had the same experience. I find confidence helps get the message across, but never had to use an aggressive response. Um typo near the bottom of my previous comment…Not “I identify your weaknesses…” but just “Identify your weaknesses”…No I ain’t in the counselling business! The first thing that comes to my mind is that I, as the artist, have to be honest with myself and my work. If I paint something because it sells well, but I’m “selling my soul” to do it, that’s going to come through, and I think my audience will pick up on it. I need to be honest in my pricing, and fulfill my obligations (commissions, email responses, paying suppliers). I need to be supportive of other artists and their work, not verbally throwing them under the bus to try to make myself look better. Self-honesty, definitely. This goes along, Ruth, with Sari’s point about being trustworthy to generate trust. The point about what your audience will “pick up” is priceless. So often the subtle forces of what I call your energetic fingerprint simply gets lost in the focus on 3D realities. I have found open, honest, attentive communication to be very helpful in building trust in my audience. Oh, and don’t leave out “kind” in that string of adjectives. Not only are people often quite excited about talking to The Artist, they all have the same need I have to speak and be heard. Add gentle humor to that, and you can really make an impact…on them And on yourself. Oh, I’m loving adding “kind” to the trust list. And the desire to be heard/seen – give that to someone and it’s pretty darn hard for them to forget you or your work!